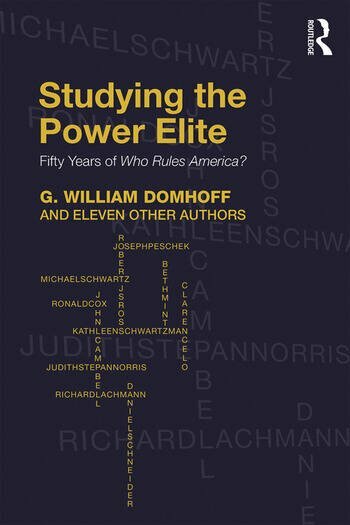 Studying the Power Elite: Fifty Years of Who Rules America? This book critiques and extends the analysis of power in the classic, Who Rules America?, on the fiftieth anniversary of its original publication in 1967—and through its subsequent editions. The chapters, written especially for this book by twelve sociologists and political scientists, provide fresh insights and new findings on many contemporary topics, among them the concerted attempt to privatize public schools; foreign policy and the growing role of the military-industrial component of the power elite; the successes and failures of union challenges to the power elite; the ongoing and increasingly global battles of a major sector of agribusiness; and the surprising details of how those who hold to the egalitarian values of social democracy were able to tip the scales in a bitter conflict within the power elite itself on a crucial banking reform in the aftermath of the Great Recession. These social scientists thereby point the way forward in the study of power, not just in the United States, but globally. A brief introductory chapter situates Who Rules America? within the context of the most visible theories of power over the past fifty years—pluralism, Marxism, Millsian elite theory, and historical institutionalism. Then, a chapter by G. William Domhoff, the author of Who Rules America?, takes us behind the scenes on how the original version was researched and written, tracing the evolution of the book in terms of new concepts and research discoveries by Domhoff himself, as well as many other power structure researchers, through the 2014 seventh edition. G. William Domhoff is Distinguished Professor Emeritus and Research Professor at the University of California, Santa Cruz, where he has taught since 1965 after three years at California State University, Los Angeles. In addition to Who Rules America? The Triumph Of The Corporate Rich 7e (McGraw-Hill 2014), he has most recently authored or co-authored The Leftmost City: Power And Progressive Politics in Santa Cruz (with Richard Gendron, Westview Press 2008); Class and Power In the New Deal: Corporate Moderates, Southern Democrats, And The Liberal-Labor Coalition (with Michael J. Webber, Stanford University Press 2011); The Myth Of Liberal Ascendancy: Corporate Dominance From The Great Depression To the Great Recession (Routledge 2013); and The New CEOs: Women, African American, Latino, and Asian American Leaders Of Fortune 500 Companies (with Richard L. Zweigenhaft, Rowman & Littlefield 2014). John L. Campbell is the Class of 1925 Professor, Professor of Sociology, and Chair of the Sociology Department at Dartmouth College, and Professor of Political Economy at the Department of Business and Politics, Copenhagen Business School. His most recent books are The National Origins of Policy Ideas: Knowledge Regimes in the United States, France, Germany and Denmark (Princeton University Press, 2014), The World of States (Bloomsbury Press, 2015), and The Paradox of Vulnerability, States, Nationalism and the Financial Crisis (Princeton University Press). Ronald W. Cox is Professor of Politics and International Relations at Florida International University. He has written or edited five books, including Power and Profits: U.S. Policy in Central America (University of Kentucky Press 1994), U.S. Politics and the Global Economy (with Daniel Skidmore-Hess, Lynne Rienner 1999), and Corporate Power and Globalization in U.S. Foreign Policy (Routledge 2012). He is currently finishing Transnational Corporations and the New Globalization for Lexington Books. Richard W. Lachmann is Professor of Sociology at the University at Albany, State University of New York. He is the author most recently of States and Power (Polity 2010) and What Is Historical Sociology? (Polity 2013). He currently is writing a book entitled First Class Passengers on a Sinking Ship: Elite Privilege and the Decline of Great Powers, 1492-2015 which examines the decline of dominant economic and military powers in early modern Europe and the contemporary United States. Clarence Y.H. Lo is Associate Professor of Sociology and Director of the Peace Studies Program at the University of Missouri at Columbia, MO. He is the author of Small Property versus Big Government: Social Origins of the Property Tax Revolt (Univ. of California Press 1995), co-editor of Social Policy and the Conservative Agenda, and author of numerous articles on elites, the state, and right-wing social movements. Beth Mintz is Professor of Sociology at the University of Vermont. She is co-author (with Michael Schwartz) of The Power Structure of American Business (University of Chicago Press 1987) and is currently working on a book on the role of neoliberalism in the crisis in higher education. Her earlier research includes studies of the corporate elite; policy formation within the health care sector; and the intersection of gender, race, and ethnicity in U.S. labor markets. Joseph G. Peschek is Professor of Political Science at Hamline University in St. Paul, Minnesota. He is a former editor of the scholarly journal New Political Science. His most recent book, co-authored with William F. Grover, is The Unsustainable Presidency: Clinton, Bush, Obama and Beyond (Palgrave Macmillan 2014). Robert J.S. Ross is a Research Professor at Clark University’s Department of Sociology and the Mosakowski Institute for Public enterprise. He is the author (with Kent Trachte) of Global Capitalism: The New Leviathan (SUNY Press 1990) and Slaves to Fashion: Poverty and Abuse in the New Sweatshops (Michigan 2004); his recent commentary is found in American Prospect and Dissent. A former chair of the American Sociological Association Section on Political Economy of the World System, Ross was also Chair of the Clark University Faculty Assembly. Daniel J. Schneider is a Lecturer in the Department of Sociology at Chapman University. His research focuses on race and gender in the areas of work, occupations, labor and politics. He is author of "Organized Labor and the Unionization of Hispanic, Filipino and Chinese Americans in the United States" in Labor Studies and is currently completing a manuscript, Gendering Profession: Experiences of Nursing in the United States. Michael Schwartz, Distinguished Teaching Professor of Sociology, Emeritus, at Stony Brook University, has published extensively in the areas of network analysis, political structure and policy, social movements, political economy, and war and insurgency. Among his scores of articles and seven books are the widely acclaimed Radical Protest and Social Structure , a pioneering work in historical sociology and social movement analysis; The Power Structure of American Business (with Beth Mintz,),an award winning analysis of American business structure, and War Without End, a political-economic analysis of the origins and impact of the war in Iraq. His scholarship, journalism, and political commentaries on the U.S. domestic and foreign policy has appeared in numerous academic, popular, and electronic outlets. Kathleen C. Schwartzman is Professor of Sociology at the University of Arizona. She has written about the economic-political connection in Portugal, Cuba, South Africa, Mexico, and, Brazil. Currently she is looking at the impact of China’s recent dominance in global garlic exports on Mexico’s rural economy. Schwartzman is the author of The Chicken Trail: Following Workers, Migrants, and Corporations Across the Americas (Cornell University Press 2013). Judith Stepan-Norris is Professor of Sociology and Vice Provost for Academic Planning at the University of California, Irvine (UCI). She previously served as a UCI Equity Advisor, and as Chair of the UCI Academic Senate, the ASA Political Sociology Section, and the ASA Labor and Labor Movements Section. She also served as Co-Editor of Contemporary Sociology and as Associate Editor of Social Problems. She is author (with Maurice Zeitlin) of Left Out: Reds and America's Industrial Unions (Cambridge University Press 2003) and (also with Maurice Zeitlin) Talking Union (University of Illinois Press 1996).